Yesterday, in the first major court skirmish in developer Phil Tagami’s lawsuit against the City of Oakland, United States District Judge Vince Chhabria indicated he was likely to deny the City’s motion to dismiss a breach of contract claim, he is inclined to allow Sierra Club and San Francisco Baykeeper to intervene as parties in the lawsuit, and he will defer consideration of the would-be intervenors’ arguments for partial dismissal of Tagami’s claim that the City’s ordinance banning coal storage and handling violates the Commerce Clause of the U.S. Constitution. Forty supporters of No Coal in Oakland, many decked out in red No Coal T-shirts, looked on as lawyers representing the City of Oakland, Tagami’s Oakland Bulk and Oversized Terminal LLC (OBOT), and the environmental organizations answered the judge’s questions about arguments set forth in their briefs. The judge began the hearing by expressing skepticism about the City of Oakland’s main argument for dismissal of the breach of contract claim. “I don’t really understand your argument,” he said. OBOT claims that, by banning coal storage and handling in 2016, the City of Oakland breached its 2013 Development Agreement (DA), which OBOT claims gave it a vested right to build and operate a bulk commodities terminal at the West Gateway site under the regulations as they existed at the time of the agreement. In its motion to dismiss the breach of contract claim, the City argued that, although the DA gives OBOT a vested right to develop and operate a bulk commodities terminal at the West Gateway site, the agreement confers no right to store and handle coal and coke or any other particular commodity. Oakland’s attorney, Kevin Siegel, asserted that the right to handle coal at the terminal needed to be “expressly” stated in the agreement. The judge then asked Siegel whether, according to the City’s theory, it would be OK under the DA for the City to impose a new ordinance limiting the terminal to shipping a single commodity—for example, cotton. Siegel answered that such an extreme limitation would deprive the terminal of feasibility and, therefore, would go too far. Although Judge Chhabria did not rule immediately on the City’s motion to dismiss OBOT’s breach of contract claim, it appeared nearly certain that he will deny the motion when he issues his written decision. The ruling would allow OBOT to gather evidence to support its breach of contract claim which the City will be able to challenge again in a summary judgment motion or at trial. Sierra Club and San Francisco Baykeeper fared better than the City of Oakland. Judge Chhabria indicated that he was inclined to rule in favor of their motion to intervene as parties in the lawsuit. Intervenors can bring motions, argue in court, take discovery, appear at trial, appeal an unfavorable outcome, and, generally, participate actively in all aspects of the litigation. 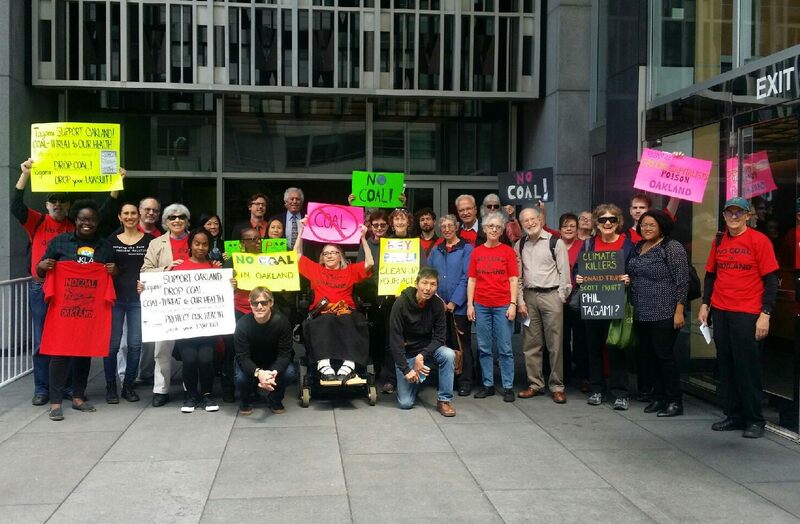 Representing the environmental groups, Earthjustice attorney Colin O’Brien argued that they would bring specialized legal expertise to the case and could not rely on the City of Oakland to ensure that their interests would be fully represented by the City. O’Brien referred to the possibility that the two groups might make different arguments from the City. Judge Chhabria acknowledged that Sierra Club and Baykeeper would bring additional legal expertise to aid the City in defending its coal ordinance, but wanted to be certain that allowing them to intervene in the lawsuit would not give them the power to veto a settlement that the City might reach with the developer. OBOT vigorously opposed the environmental groups’ entry into the case. Shaw’s argument led to a moment of levity when the judge asked whether “the little law firm” OBOT hired was afraid it wouldn’t be able to keep up with the resources of the City of Oakland and the two nonprofit organizations. The courtroom erupted in laughter. Shaw’s law firm, Quinn Emanuel, is one of the richest law firms on the planet with average partner earnings of $4.4 million in 2015. Although Sierra Club and Baykeeper appear likely to join the case, Judge Chhabria rejected their motion to dismiss portions of OBOT’s claim that the Oakland coal ordinance violates the Commerce Clause of the U.S. Constitution. He noted that the motion, on its face, addressed only two of three legal theories advanced by OBOT in support of the claim. As a ruling on the motion would not dispose of an entire claim, he doubted it would be useful to grant the motion. Denying the motion on that ground would leave the substantive legal arguments over the Constitutional claim to be taken up at a later point in the litigation. Judge Chhabria established what he termed an “aggressive, accelerated schedule” for getting the case to trial on January 16, 2018, close to what OBOT sought. He denied the City’s request for a more moderate pace leading to a trial in September of next year. Judge Chhabria also weighed in on the parties’ dispute over how much discovery would be required. The City has argued that the case should be based on the legislative record compiled by the City which includes the thousands of pages of reports, correspondence, and other public documents. OBOT claims that the City’s process was a sham designed to provide cover for a decision that was made long before the public hearings on health and safety that took place over a 10-month period in 2015 and 2016. OBOT wants to conduct wide-open discovery including depositions of City Council members. Judge Chhabria will be issuing an order spelling out his decisions on the motions to intervene and dismiss. Watch this website for updates. Some press coverage of the hearing implied that the motion before the court yesterday might have resulted in complete dismissal of the case, which is inaccurate. Even if the judge had approved the two motions to dismiss, other claims in the lawsuit would have remained to be litigated. A report of yesterday’s proceedings by Darwin Bond-Graham appeared on the East Bay Express website here.